Well, it didn’t take them long, did it? In what’s been an astronomically busy couple of weeks for Mark Zuckerberg’s now company that is Facebook, it has now taken the wraps off its camera app, which gives the recently acquired Instagram a run for its money. When Facebook shocked the tech world by announcing the purchase of Instagram for an eye-watering $1 billion last month, many feared it was the beginning of the end of the people’s favorite app. However, Zuck promised that the 50+ million strong network of avid image sharers was not in jeopardy, and would keep its identity and work alongside Facebook and its other apps. True to his word, that has remained the case, and today the world’s most popular social network with nearly a billion active users (yes, almost one sixth of the world are connected through Facebook), launches an in-house offering of its own. 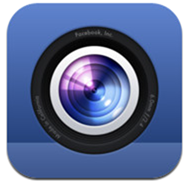 While the Facebook version will level the playing field rather nicely, it must also be quite satisfying to know that, whether the Facebook Camera app topples Instagram or not, there’s only going to be one winner. Like most large corporations, Facebook has already eradicated the competition, and now it will be interesting to see whether Facebookers take to the camera app, or whether the start-up app is already too far ahead of the game. Facebook has tried and failed on numerous occasions to obliterate competition, but short of the Instagram acquisition, has failed to do so. It’s check-in service didn’t capture the imagination like Foursquare had already done, but having secured the main rival this time around, it’s more a case of large-scale monopoly than real competition. Still, what of the app itself? Well, in a nutshell, you snap, filter and share, and keeping true to its ethos, you can add a bunch of photos in one hit, so instead of seeking the very best shots and pushing them out for the world to see (like you would on, say, Instagram), you can dredge every single image from your device’s Camera Roll. Marvelous! It’s free of charge, and can be downloaded right now from the App Store. Oh yeah, and like Instagram, if you’re on an iPad, it’s going to be compatibility mode again, I’m afraid.